Needed: Lamp for bed headboard used for night time reading. 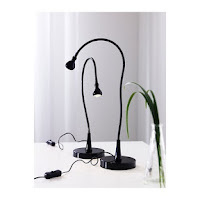 I wanted a light that would be bright, dim and not be hot.The Jansjo looked good except the color, stand and switch. First I changed the color from White to brown to match the color of the wooden head board. I was able to pop the lens out (not easy without leaving minor marks on edges) of the lamp head in order to full cover with spray paint. Easiest way was to not attach the based and just hang the light by the cord. With the lens out I was able to mask off the LED and reflector. Next I needed a new based that would attache to the head board. 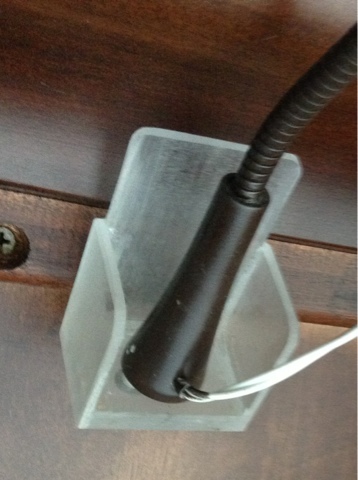 The plastic bracket is made from scraps that were glued and sanded. The original design was setup to enable it to swing out of the way, however the hooks used weren't big enough. It is now screwed directly into the headboard. The back of the headboard was not finished and not viewable otherwise. Dimming LEDs is typically done using a PWM method of controlling the power. Found an LED "Dimmer" on Amazon that didn't fit the requirements however looked hackable also. This $6 dimmer was setup to control 12v at 8amps, however the Jansjo lamp was 4 volts and .75 amps. The dimmer uses a Microchip PIC micro controller (uC) to generate the PWM control of a power transistor based on the analog voltage referenced from a 10K potentiometer. Most uCs used 5 or 3.3volts, this one was 5v. Tracing the circuit board of surfaced that the positive input was tied to the positive output indicting that the power transistor was switching the negative side for the PWM. To modify the dimmer to operate at 4v rather than 12v, a jumper wire was added (the white wire in the picture) to by pass the voltage regulator that dropped the expected 12v input to 5v for powering the PIC uC. The dimmer works fine with the 4v input from the Jansjo transfer. Adding the dimmer also resolved a design defect of the original switch on the Jansjo. The switch wore on quickly with little use. It was simple rocker that didn't always maintain contact so the light would flicker or not turn on fully without pressing very hard on the switch. Putting the dimmer on removed that defective switch. The case for the dimmer was roomed and replaced with 1" shrink tube. The setup will be located behind the headboard and does not require significant protection. The potentiometer will be extended easier given the connector. I plan to use servo wire and connector to mount the pot within easy reach. So far no issues after building this for two lights and running for 8 hours. This dimmer/PWM generator has some potential for other uses such as motor control or other types of lights. Easy to hack. This light that now meets all of the requirements cost time (off set by learning experience and excuse to build something) less than $20. Nice! I like this idea for the dimmer. The circuit broad was different then what you have photographed. I hope I can figure out where I need to put the jumper wire. Thanks for the information! I had the same problem with the switch causing the light to flicker on this otherwise decent reading light. Hoping for a simpler solution, I found a PWM controller rated for 5-24v and hooked it up to a universal power supply, but I have to run it at 6v for the PWM controller to work. Is this going to damage the lamp? You may have a similar situation as the PWM controller I had. Mine had a voltage reg that required a min of 6 volts to regulate down to 5v in order for the PIC to run. The voltage reg wouldn't work with out a min of 6v, so by passing it removed the ability to use the PWM controller at a high voltage, however given I knew the input voltage was less than max for the controller it was fine. I am not sure what the specs are on the LED in the lamp unit. Consider that the voltage going to the lamp is likely something less than 6v. Running it at high voltage that it is spec'ed at could reduce the life of the LED and could get warmer than designed for. 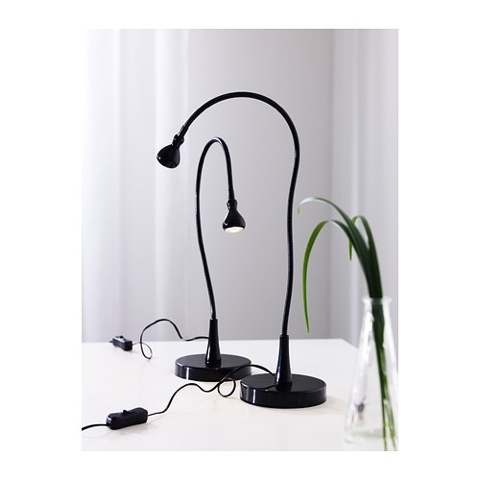 Hi Matthew, thank you for your article, as I own exactly the same dimmer could I ask you to have a more detailed photo (or sketch) of the hack in order to do exactly the same on my ikea Jansjo lamp? Sorry to boring you but I do not have the same skill and competencies as you have... Thanks a lot!